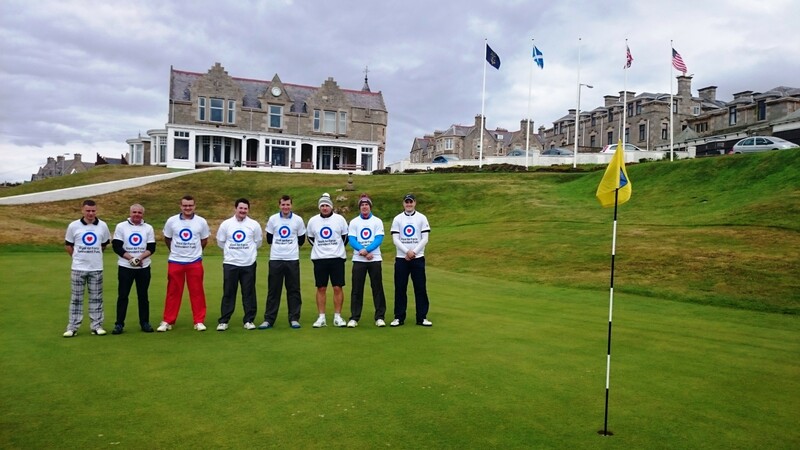 Airmen from RAF Lossiemouth have raised more than £1,000 for charity during an exhausting golfing fundraiser. Air and ground crew from the XV(R) Squadron celebrated the group’s 100th anniversary with a marathon putting session at Moray Golf Course, which lasted from 4am to 8pm on Friday. The eight players each walked 25 miles during the game, playing one hole for every year the squadron has served in the RAF. Players Ollie Harbridge, Dave Gallie, Gary Watt, Steven McMeeking, John Higginson, Grant Hamilton, Andrew Campbell and Stephen Munro took 16 hours to complete the game. As well as marking the squadron’s centenary, the event was held to raise money for the RAF Benevolent Fund (RAFBF). Chairwoman of the Lossiemouth RAFBF, Karen Cox, said: “It was a wonderful moment to watch the RAFBF T-shirts get closer as the fundraisers approached the 18th hole for the final time. “They all looked absolutely exhausted but some were still in high spirits, and they definitely earned all the sponsorship they had received. The Lossiemouth-based XV(R) Squadron aims to celebrate this year’s anniversary milestone by raising a total of £15,000 for the RAFBF. Last month the Lossiemouth RAFBF staged a 66-mile Cairngorm to Coast event. Rebecca Scott, 23, and Emma Zweig, 30, both from RAF Lossiemouth’s squadron, were the only two out of 18 entrants to endure the entire course.